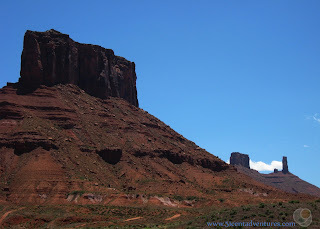 Description: There are many ways to enjoy the scenery in Moab, Utah. You can hike or bike on many of the trails. There are even trails for your ATV or your Jeep. If you want a bird's eye view of the area you can charter an airplane ride, and if you are really adventurous you can even skydive. But perhaps the most refreshing way to enjoy the scenery is to take a river rafting trip on the Colorado River. Location: This post features the Fisher Towers Section of the Colorado River. This section is north of Moab, Utah. I've listed other places to raft in the Moab area at the end of this post. Cost: Varies depending on the company that you go through and the length of your trip. The Fisher Towers Section of the river is generally less than $75 per person for a full day trip. Operating Seasons and Hours: Mostly the spring and summer. Helpful Website: Discover Moab is a great place to start when you are trying to learn about the different companies that provide river tours. 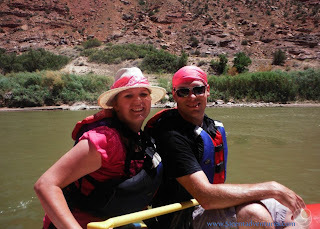 I've also included a list of different rafting companies at the end of this post. This is part of the "alternate route" to our Southern Utah Road Trip. 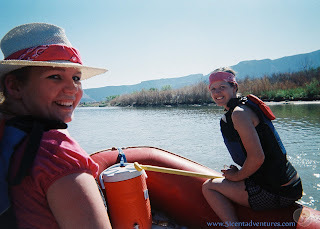 During our actual road trip in 2010 all my husband and I did was drive alongside the Colorado River, Rafting on the river was something we did two years later on a weekend trip. I'm adding it to my Southern Utah Series because it is something you could add to your own trip to Moab. First I need to give you a little bit of background information for what happened to our family in the two years between our epic Southern Utah Road Trip in 2010 and our little weekend trip to Moab in 2012. My husband found a job as a gate agent with an airline, and in October of that year I gave birth to identical twin girls. We entered a very sleep deprived and stressful phase of our lives. It was also a happy time. Life got even more tiring/stressful/happy when not even a year later I became pregnant again. Our son was born in April of 2012. The airline job wasn't the type of job that could support a family so my husband started looking for a new job. After much deliberation my husband decided to join the United States Army. While he waited for his enlistment date he took a job with a Utah based company. The work environment was great and the company was wonderful. One of the great things the company would do was treat employees and their spouses to an annual trip. 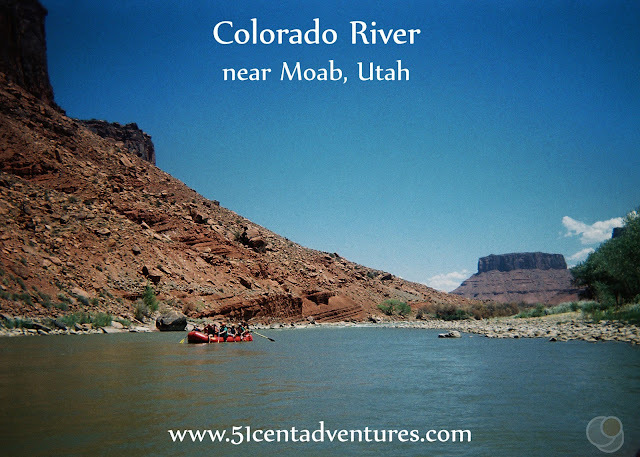 They had planned a river rafting trip in Moab for the end of June during the time my husband worked there. Even though our twins weren't even two years old and our baby boy was only 2 months old we jumped at the chance to go on this weekend trip. (Or maybe it was because our twins weren't even two years old and our baby boy was only 2 months old that we jumped at the chance.) My parents agreed to watch the children, and we were able to enjoy three days as just a couple again. Our lives were turning out to be pretty hectic, and so this trip was just what we needed. My husband's company paid for us to stay in a motel for two nights. We came down to Moab on Friday night and enjoyed exploring Moab's Mainstreet that night. The next day we met up with the other rafters at a park in Moab. We boarded buses that took us up Highway 128 to an area where rafts were waiting for us. We were near Fisher Towers, but I don't remember the exact area where we were dropped off. We boarded our rafts and our river guide helped take us down the river. There were 6 other passengers in the boat with us. We all had oars, but for the most part we didn't need to use them. Our guide told us that this was our vacation, and he wouldn't make us work on our vacation. He had two large oars that he used to steer the boat. The trip was part of a Raft for the Cure event to raise money for breast cancer research. There were many other people participating in the event. There were several rafting companies involved, but our guide happened to be from the World Wide River Expeditions Company. 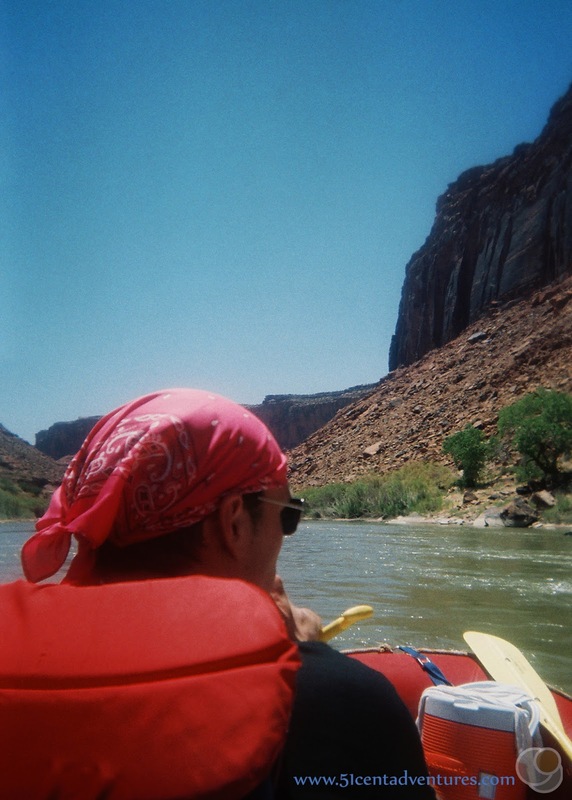 They are the only rafting company in Moab that doesn't work on Sundays. They cater primarily to Youth Conference and Scouting Groups, but they will work with anyone. I thought that we'd sit inside the raft, but since the water was so calm we were able to straddle the edge. It was nice to put my legs into the cold water. This stretch of the Colorado River isn't rough like other parts of it can be. Occasionally there were a few small rapids, and our guide would warn us to hold on and help him paddle during those. Many times throughout the trip our guide would let us get into the water and float alongside the raft. He'd warn us when we needed to get back into the boat when we were were coming to a rocky area. As we traveled our guide would point out different features of interest. Everything was so pretty. Of course, I had seen scenery like this before, but it was different to admire it from the river. I guess it was one of the first times I was really able to just focus on the scenery. When I'm riding in a car I'm usually trying to navigate, and it's hard to fully appreciate a landmark as we whiz by at 60 miles per hour. Even when I'm hiking I can be distracted by the heat or rough terrain. But as we lazily floated down the river I was able to just appreciate the journey and the things that we saw. I also really liked the fact that we really had only one option for which way to go - down river. That trip down the river did a lot to calm my frazzled-mother-to-multiple-young-children-nerves. Halfway through the trip we stopped at the Red Cliffs Lodge for a catered lunch. Then we were on our way again for a few more hours of fun. 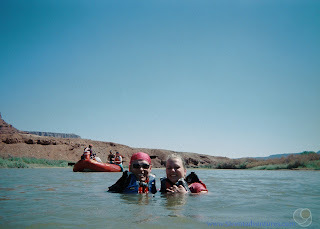 I'd assumed we'd float all the way into Moab, but really we got out of the boats and boarded the buses again a few miles up river from Moab. We'd been on the river for about 6 hours, and they had all been wonderful. I could finally cross river rafting off my bucket list. However, I think this trip only wet my appetite. I want to go white water rafting next, and one day I'd like to do a multi-day trip with camping each night. Recommendation: Everyone should take a rafting trip at least once in their lives. This section of the Colorado River is calm enough that anyone could enjoy it and feel safe. Directions: Most rafting companies will provide transportation to the starting location near Fisher Towers. But here's a map for reference. Here is a list of the companies who offer river rafting tours. This information is according to Discover Moab. I think this is a comprehensive list, but I might be wrong. I thought about making a nice little comparison chart of prices and the different trip options. But I don't feel like going down that particular rabbit hole at the moment. So you'll have to do your own research to find out which company will work for you. The Westwater Canyon section of the Colorado River. This area is farther up river from the Fisher Towers section. The Cataract Canyon section of the Colorado River. This 100 mile journey goes through Canyonlands National Park. Trips on this part of the river can span days, and take you through some of the best white water rafting areas in the country. The Green River. I was surprised to find out that this river also has rafting areas. They are located north of the town of Green River, Utah. Next Stop: Crystal Geyser near Green River, Utah.